Forgive me for not updating sooner. If you have been following our journey you know that Paul was listed as status 1a on the transplant list on December 9th. He was listed due to worsening heart function and worsening plastic bronchitis. In late August as means to save his life Paul underwent a procedure called a lymphatic angiogram in Philadelphia where doctors worked to cauterize problematic lymphatic channels that were dumping fluid into Paul's lungs. It worked to save his life but it did not cure his plastic bronchitis. Between September and December he was hospitalized 9 times for plastic bronchitis flare ups or casting. The way to treat pb is heart transplant but doctors in philadelphia have created a new procedure (the lymphatic angiogram) that is curing it for some cases. This procedure is something we always knew we may need to go back to Philly again for another procedure we just didn't know it would be so soon. 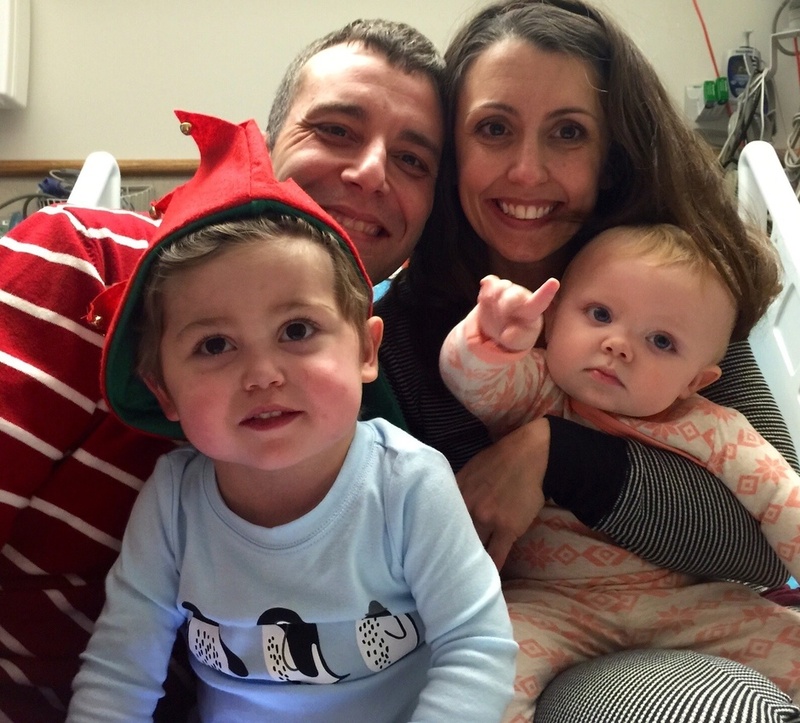 On December 21st Paul was life flighted to Philly for another procedure that took place on December 23rd. Paul made history again as the first person to undergo this procedure a second time. Georgia traveled by way of plane and was delivered to chop by my fraternal family- Kristin and Jay. My inlaws met us here to spend Christmas at chop. They did a bronchoscope, wash, and culture, and MRI to look at his lymphatic system and a cardiac catheterization to look at his heart function. His lymphatic system was still diffusley abnormal and his heart function is moderately depressed. His pressures were 14 (on the high side) and his lungs looked fairly full of junk and pretty enflamed. He also tested positive for a bacteria called Pseudomonas. This mostly occurs in hospitalized people with compromised lungs and immune systems. The bacteria may have been contributing to casting or casting may have helped the lungs to have been a great place for bacteria to grow. Who knows- he will have a 14 day course of Iv antibiotics to help treat this. All this data was not great news but what we expected to hear. In the face of all of this they were able to more aggressively treat the lymphatic system and yet again cauterize the abnormal channels and this time chose to glue off permanently one large problematic channel. There sense now is that Paul was likely born with abnormal lymphatics that in the face of congenital heart disease have caused a major issue for him. They think this may help him be a better heart transplant candidate and they hope he may not need a new heart. In the end he still has worsening heart function- that may be due to all of the stuff going on in his lungs and could get better overtime or could be because he also has heart function issues. Docs at vanderbilt put him on an Iv medication to help his heart function better and even with that medication on board his heart function is still not awesome- maybe it's helping and maybe not. Paul is a wonderfully complex puzzle and no one can figure him out. He's thriving in the face of all of this and so happy and bouncy and loving- no one can believe how good he looks. All that IV medicine buys us a ticket to continue living in the hospital until he doesn't need it anymore or gets a new heart. We will continue living in the hospital until Paul's ready to leave. Paul healed quickly after this procedure. On the 24th I got sick and my mother in law took over gg and Dan was with Paul. Dan should be praised and awarded for all the hard work he put into helping Paul recover- he was the one that got him through this and they survived with flying colors! Paul's ready- just five days post procedure- to be transported back to vanderbilt. We leave today - in just a few hours. We are going home- well homeish to our favorite floor in the world next to our own- 7a at vanderbilt! Paul and I will take a life flight again this morning. We had an incredible Christmas with our family and friends the Jackley family and with the Ross family who are inpatient with their little one Xavier. Jackie Ross the mother is my hero- I have known her online for three years and I got to spend some time with her beautiful family- what a gift! We will do another mini Christmas in the hospital in Nashville too. The kids were overjoyed by toys and the spirit of the holiday. We certainly celebrated the birth of Christ remembering because of him we live! Thanks to all of you for all the love and support. Merry Christmas, Melchiorre Family! What a wonderful update, and all of you will continue to be in my thoughts and prayers! Continue to pray for you here in Cincinnati at St. Timothy's Episcopal and in my own prayers. So glad all went well. Saw Dan before you all left. What a beautiful family and Paul is such a fighter. Merry Christmas and here's to a great 2015 for your family. Sending prayers and hugs. Thoughts, prayers and lots of warm energy for you Melchiorres!! I just want to send a note telling you how inspirational you really are! My sister and brother in law are friends of yours (Tascha and Dan Haas) and I have been following your story since the beginning of Paul's battle. As a parent, I just cannot imagine the heartbreak that you face every single day and the fact that you both still hold together everything in your every day lives really inspires me. I wish there was more I could do to help your struggle but know that I do pray and think of your family often! Always sending good vibes your way! I am happy to hear that he is all OK now. We have been reading your journals and they did actually make me so sad hearing about the difficulties he had to suffer throughout. Now that the operation is successful, he is out of all the sufferings. went to Beijing to take the final medal, a small star and red net has a certain popularity, http://www.geolidar.ru/ but also open up the Beijing market. Their north drift, just a drift, play. SpiderOak is a abreast managed business who are based in Northbrook, Illinois and were formed in December 2007. They run an Online Backup, Online Synchronization and Online Administration Annual which gives 100Gb of web accumulator for $10 per ages and you can accept up to 1.5Tb of accumulator in 100Gb chunks, anniversary block costing an added $10 a month.